Canopies are designed utilizing high grade raw material and modern techniques which gives a trendy classy look to the entrance of your house. They are made up of superior quality raw material with unique designs, stringent quality and are available in customized designs, colours, shapes and sizes. Their unique designs and colours are used to make the user happy and satisfied. We offer a wide array of canopies that are used for commercial and residential usage. 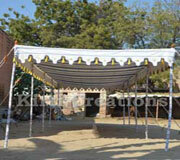 This elegantly designed Indian Canopy is a unique piece of attraction in wedding ceremonies. The whole structure stands firm on the ground with the help of its sturdy poles that holds it tight in any unwanted weather conditions. With its impressive combination of red and white colors, this Handmade Canopy reflects an attractive attraction in the occasions. 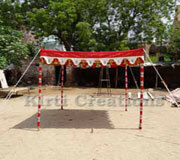 This well tied Handmade Canopy is best suited in those places where there is a celebration lasting for long days. This Outdoor Canopy features a unique design and attractive finish of white color on its whole fabric. 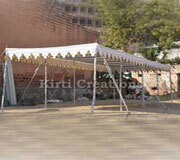 With its large size, Outdoor Canopy is suitable for big occasions where there is a requirement of big spaces. 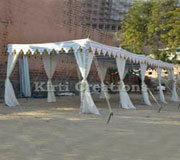 To celebrate the party with immense enjoyment, this Party Canopy is widely preferred for its beautiful look. 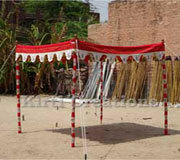 The white curved strips hanging along the red colored roof of Party Canopy gives an impressive look to the whole tent. For any occasions held in the lawns or gardens, this beautifully designed Garden Canopy provides a space for celebration. Alternate pattern of red and white on its bamboo gives a unique look to this attractive Garden Canopy. This Wedding Canopy is a beautiful option to nicely organize the wedding ceremony. 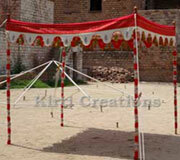 The Wedding Canopy looks very colorful and attractive due to multi-pattern of colors on its fabric. Its whole design is made to give an exceptional traditional look.